The ACU-RITE VUE is an up-to-three-axis device mainly used as position display unit for simple infeed and positioning tasks, such as on grinding machines, drilling and boring machines, press brakes, crosscut saws, for positioning on rotary tables, etc. 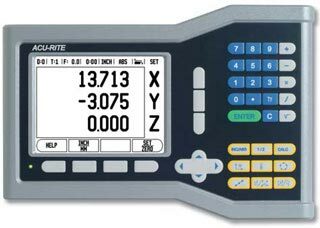 The clear and unambiguous display of the current position value on the large, clearly structured LCD screen makes working with the VUE easy and reliable. The position display unit has a robust housing and a membrane keyboard.